This hardworking roper is built with our signature ICE™ outsole and crafted in rustic, natural leathers for bold contrast. I love these boots! Fit good, look great and got them on sale! I’m very pleased with the product and transaction, I’ll buy from shoeline and double h again. Beautiful boot ordered the same size as last 6 pair an it didn’t even come close to fitting. 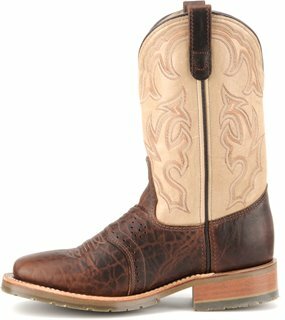 Like all double H boots tgat are made in the USA they fit and feel great! My wife bought these for me. Had them stretched a little but they're a great boot. Great Boot. It is hard to find an affortable boot that is not made in China. This is my first pair of Double H boots but it will not be my last. Great boot not my first pair of double H boots. 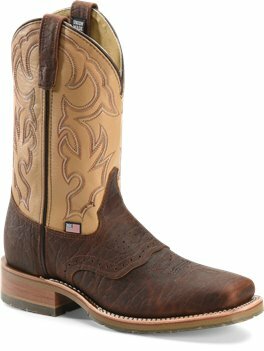 Great fit nice grain very comfortable roper style work boot. Really liked the color. And the greatest thing they are made in the USA.